As far as paradise islands go, few come more beautiful than Grenada. A mountainous and volcanic landscape gives the country one of the loveliest environments in the Caribbean, with crater lakes, rainforests and coastal mangrove plantations giving way to white sand beaches, and brilliant blue waters filled with coral reefs. What's not to like? Grenada is known as the Spice Island for good reason. Nutmeg, cloves, cinnamon, ginger and vanilla are just a few of the scented gems found here. When it comes to food, Grenadians like it particularly hot and spicy. Pepper pot is a favourite – meat cooked with lots of garlic, onions and, you guessed it, pepper. As well as fragrant spices, music is also an important part of life on Grenada, with the calypso tunes dancing over the island evoking Grenadians' African origins. Many will, of course, be drawn to Grenada for its beaches. They are several dozen of them, immaculate and well-preserved, while digging a bit deeper will bring you to isolated coves where it'll be just you and the sea. Bring your snorkelling gear – there are plenty of colourful fish species to be glimpsed. If there's only so much lounging on a beach you can tolerate, pick up one of the many nature trails running across the island that'll take you through wilderness brimming with wildlife. Expect to see rare birds in the rainforest and monkeys in the loftier terrain. You're also likely to cross one or two spice plantations, whose beguiling aromas are one of the trademarks of Grenada. 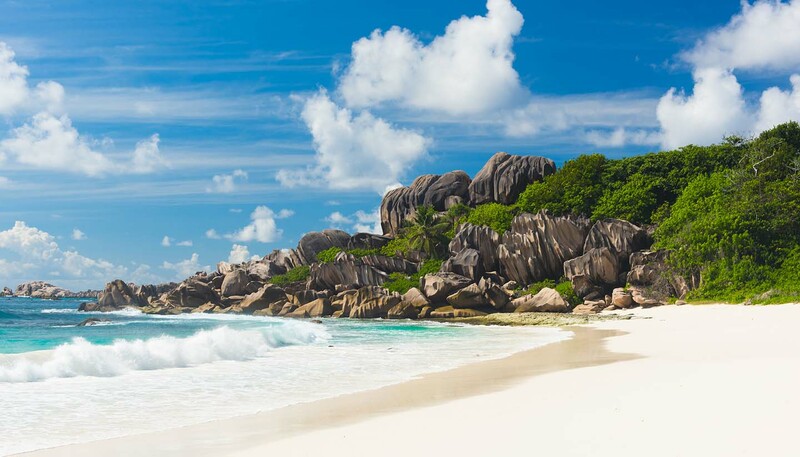 The capital, St George's, is a pretty city boasting one of the finest beaches in the Caribbean, Grand Anse. Meanwhile, day trips to neighbouring islands come highly recommended for those keen on sailing, diving and fishing. For unassailable tranquility, spend some time on the islet of Carriacou, whose simple, idyllic way of life is sure to charm. In fact, on the whole of Grenada, there are no colossal resorts, meaning peace, quiet and nature are largely the order of the day, along with a friendly and welcoming population. 344 sq km (132 sq miles). HM Queen Elizabeth II since 1952, represented locally by Governor-General Cécile La Grenade since 2013. The hurricane season in Grenada normally runs from June to November. You should monitor local and international weather updates from the US National Hurricane Center and follow the advice of local authorities, including any evacuation orders. UK health authorities have classified Grenada as having a risk of Zika virus transmission. For more information and advice, visit the National Travel Health Network and Centre website. Cases of Chikungunya virus have been confirmed in Grenada. You should take steps to avoid being bitten by mosquitoes. Most visits to Grenada are trouble-free but there have been incidents of crime including armed robbery and sexual assault. Although there’s no recent history of terrorism in Grenada, attacks can’t be ruled out. Consular support may be limited in Grenada as there is no British High Commission office. However, the British High Commission in Bridgetown, Barbados, can provide consular support. Most visits are trouble-free, but there have been incidents of violent crime including armed robbery and sexual assault. Take extra care when driving at night as some roads are unlit. Road signs and hazards may not be easily visible. Don’t stop if you’re flagged down by pedestrians. Keep car doors locked when driving. Public transport is available and cheaper rate. Minibuses drivers might drive above the speed limit. The International Civil Aviation Organisation has carried out an audit of the level of implementation of the critical elements of safety oversight in Grenada. Entry requirements may change from time to time. You should check with the Grenada High Commission in London before you travel. British passport holders don’t need a visa to visit Grenada. On entry, you’ll be granted a specified period to stay. If you wish to stay longer, you must apply for an extension of stay through the Grenada Immigration Department. Your passport should be valid for a minimum period of 6 months from the date of entry into Grenada. UK Emergency Travel Documents (ETDs) are accepted for entry, airside transit and exit from Grenada. The main government hospital can cope with many types of treatment but serious cases may mean emergency evacuation. Medical treatment in Grenada can be expensive. Make sure you have adequate travel health insurance and accessible funds to cover the cost of any medical treatment and repatriation. If you need emergency medical assistance during your trip, dial 434, 724, or 774 and ask for an ambulance. You should contact your insurance/medical assistance company promptly if you are referred to a medical facility for treatment. Before choosing to be treated at a private facility, you should check their policies on pre-payment. Private clinics may not accept medical travel insurance as payment for treatment. You should monitor the alert level of the underwater volcano ‘Kick’em Jenny’, located 5 miles off the coast of Grenada. Observe any maritime exclusion zones and follow the advice of the local authorities in the event of increased activity or eruption.